Some memories and photographs of Curridge, from the early 1900's onwards. Kindly provided by Roy Barlow. If you have any memories or old photographs of Curridge and would like to share them, please contact us. 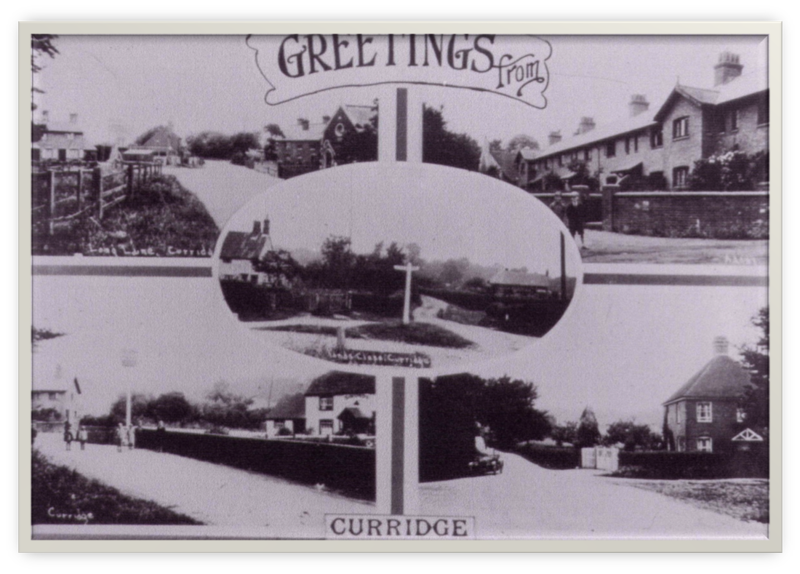 A Postcard from 1920's Curridge. This photograph shows The Lamb Inn, the Carpenters workshop next to The Lamb, The Baptist Chapel, The Blacksmiths and The Warren Farm. Today, although The Lamb still stands, it is currently empty. The Carpenter's workshop has moved up Long Lane to Red Shute Hill. The cottages on the corner have also gone, replaced with new bungalows. The Chapel is now a private home, next to Roselyn, where Luke Pocock the Blacksmith lived. The Warren farm was behind Roselyn, a busy place with stables for the heavy horses for the farm and timber carts. There was also a Piggery, Cattle, and Barlows sawmill. Long Lane Garage, now the Murco Petrol Station, was built in the 1930’s and run by Bill Collins, his wife Pat and son Ernie. Ernie was a trained engineer who also turned his hand to house building. 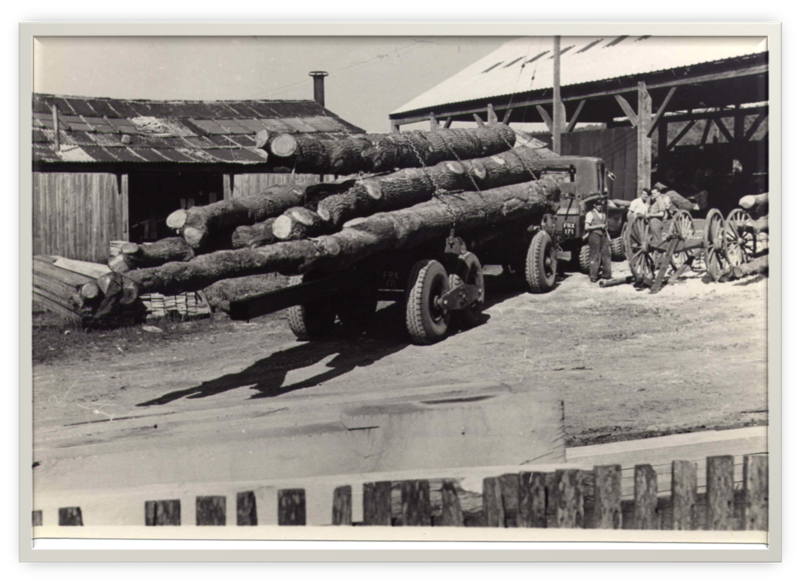 Bill also worked in the timber yard for Barlows. When the Garage was first built, there were very few cars to service, but plenty of bicycles. Petrol was pumped by hand half a gallon at a time for the princely sum of 1/5 (7p) per gallon. Bill was also the village hairdresser, providing the Long Lane bowl cut for 3d, with a slight variation for a small extra charge for the ladies. The cottage in the background was the village bakery run by Doughy Mathews, baker of fine bread. To the rear of the bakery, up Sandy Lane was the wheelwright and blacksmith workshop of Luke Pocock, where the local carts and wagons were repaired. Today this is the site of Long Lane Garage where modern carts and wagons are repaired. The photograph shows The Warren in the early 20th Century. Behind the cottages on Long Lane, in the yard, was the place where Barlows set up a steam engine and saw bench. Both sawmills and sandpits were the key industry in Long Lane during this time. Much timber was processed and moved during this time. The photograph below shows Sawmills No’s 1 and 2, on Red Shute Hill. Long Lane has had several sandpits over the years. The Long Lane sand pit no 1 was run by Mr Chivers, on the bend by the entrance to Rookery Farm. It is now overgrown but in its day it produced some 20/30,000 tons of sand for construction works in the area. Sand was also regularly collected by steam lorry and steam engine, and trailers from Sailsbury bringing chalk to Long Lane on the return trip. Long Lane Sand pit No 2 was owned and run by Jack Pocock. The sand was dug and screened by hand before being delivered by horse and cart to the local trades. Pits 1 and 2 were both closed before the WW2. In 1960’s the site was granted planning for new housing, and is now known as Sandy Close. The third sandpit in Long Lane (above pictured in 1952) was opened by Barlows, after WW2 to supply sand to the local building and construction industry. Most of post war developments around Newbury and the Greenham air base were supplied from this pit. The sand was screened originally through hand screens and then in 1952 by a new Parker screening plant enabling 25tons per hour to be produced to supply the increase in demand. There is also a steam train in the background of the photograph with oil tankers, which made daily journey from Fawley to the Midlands until the railway closed in 1960’s. The pit operated alongside the sawmill business until the pit was closed in the 1980’s. It was then filled with most of the soil excavated from developments in Lower Way, Thatcham, and other sites in the area. It is interesting to note that most of the bricks in the district are being kept apart with sand from these pits. The pit has now been returned to agriculture. The end house of Kiln Terrace, pictured in the 1940’s, was the Post Office and shop run by Mrs Parker. Stock was very limited but became very popular with children when sweets came off ration in the 50’s. The Post Office was later taken over by Mr Percy Fidler, and closed in 1992. The brickworks were owned by the Maidenhead Brick Company and managed by Mr Holmes, who lived in the end house of Kiln Terrace. Bricks were made for the local market until it closed in 1947. Ron Bates took over the site in 1948 for his haulage and recovery business. Later the site became a small light industrial area occupied by various business’s: Dixons furniture store, Newbury Steel stockholders (now moved to Red Shute Hill), Smith & Ashby heavy recovery, Mike Lawrence Farm Machinery (also moved to Red Shute Hill), Curridge Car Sales (now at Wash Water), Paul Wernham bodywork repairs (Now at Bucklebury), Toomers Calor gas. The site was closed in 1985 and was redeveloped into Curridge Park with some 43 houses. The New Inn served the village and brickyard workers for many years changing its name to the Bunk in 1988. It is said that workers at the brickworks who did not return after lunch were said to have bunked off work. As they were frequently found to be in the New Inn they were known to have “Bunked off” to the pub, hence 'The Bunk Inn'. Built in 1850’s as a private school for Miss Mary Wasey and her sister Mrs Jane Stackpole (sisters of Thomas Wasey of Priors Court) on land leased from the Dean and Chapter of Westminster, the school was licensed for Divine Service. In 1879 the school was transferred to the Education Committee of the Parishes of Chieveley and Winterbourne on condition that it could be used as a church on Sundays and Holy days. This arrangement lasted until the 1970’s when Curridge ecclesiastical parish was transferred to Hermitage. Curridge WI started in 1919. As they had no hall, monthly meetings were held at the school until 1923 when the WI rented land from the Church Commissioners for the sum of one shilling per year. The hall was erected for the sum of £325. In 1953 the WI purchased the land and in the same year, for the Coronation of Queen Elizabeth II, Curridge and Long Lane had a festive event in the field opposite the Hall. There were games, races, competitions and tea party. Village events and festivals are still held at the hall to this day. In the 1950’s this piece of land near the school came up for sale. Mr Bateman of the old Parsonage was hoping to purchase it and build a studio there. The village people were not impressed as they wanted a playground for the children. Three local gentlemen Major Bishop, Mr Williams and George Barlow purchased the land and formed the playground trust. The ground was cleared, fenced and made available to the children. The playground continues today under the umbrella of the Parish Council and a board of Trustees. For the latest information about Curridge Playground please click here. Curridge Methodist Chapel opened in 1840 and continued to serve the community until it closed in 1944. It is now a private house. Long Lane Baptist Chapel was built 1894 and paid for by local contributions. It served the community until 2004 when it closed and was sold as a private house. Curridge Farm was run by brothers Frank and Harry Osgood with their sister Kate as a traditional dairy farm until their retirement in the 1960’s when changes in agricultural demands meant a change to arable. Today Rookery Farm continues as an arable unit but the old buildings are gone, replaced with new modern buildings. Some are still used for the farm use whilst others are used for various commercial businesses. The DNSR idea was first discussed in the 1850’s as an alternative and more direct route from Oxford to Southampton docks for the movement of coal and heavy machinery for the ships. The existing route Oxford - Reading - Basingstoke was long and tedious. The first section of single track Didcot to Newbury was completed by 1881. By this time the Company needed more expertise to help run the railway plus extra funds to purchase locomotives and rolling stock and pay labour. GWR came to the rescue offering to provide all that was required and run the railway. The DNS Company then obtained the sufficient funds required to purchase land for a new line to Southampton. Construction continued and by 1885 the line was opened to Winchester and a Terminus was also constructed at Southampton. Lack of funds again meant they could not build their line from Winchester to Southampton. A deal was done with LSWR to enable the trains to run on their existing line, with terms that included: The planned construction of W-S section of line to be abandoned, LSWR to have use of the terminus at Southampton and GWR locomotives were not permitted to run over LSWR lines to Southampton. This was agreed but it meant that each time the Didcot-Southampton trains arrived at Winchester they had to change locomotives from GWR to LSWR. This continued but time lost changing locomotives offset any cost saving over the ORB route making the D-S route inefficient. In 1923 GWR purchased the railway and obtained permission to run over LSWR track and at last and uninterrupted route from D-S was obtained. Unfortunately by this time the ORBS line was running twin tracks with more modern powerful trains and the DNSR still could not compete. The Company constructed a number of small Halts on its line hoping to pick up more passengers with Pinewood halt at Hermitage opening in 1933. The goods yard at Hermitage station kept busy with livestock, agricultural supplies and timber movements. Meanwhile Pinewood brick works was producing thousands of bricks a week many being despatched by train from their own sidings. The railway struggled on with goods traffic increasing slightly and passenger service providing a convenient local service until the outbreak of WW2 when the Government realised the advantage of a direct route from the north to the Southampton docks. The line was upgraded to twin track it also closed to passenger traffic in 1943/4 to allow extra troop movements, and was very busy leading up to D-Day. The Cold Storage Depot at Hermitage was constructed at this time as part of the National emergency food store. After WW2 the passenger traffic still did not pick up although goods kept fairly busy with 10/12 trains per day, including regular oil trains to and from Fawley to the north. Road transport continued to take its toll and finally passenger traffic ceased in 1960, with goods continuing until 1962. After closure the cold store continued being served by road and was used for storage of part of the European milk lake and butter mountain. It was finally sold off in 80’s, then used by various commercial business’s until Arena sold the site, the buildings were demolished and the site redeveloped in 2004 into the housing estate Hermitage Green.